When I work with a bride and groom on their plans for their big day one of the first topics that always arises is "What is a great location for our formal wedding photographs?. Many considerations have to taken into account when I make my recommendations based upon years of experience as a Long Island and NYC wedding photographer. Logistics is usually the first thing to consider. When during the wedding day are they planning to put aside some time for the photographs? Who will participate at the chosen location (Just the wedding couple or will the bridal party and the immediate families also be a prat of this fun photography session)? How much time do we have, including allowing adequate time for travel between the various locations we’ll be visiting on the wedding day? Does anyone in the bridal entourage have any limiting physical disabilities that need to be considered? Most important, however, is the bride and groom’s vision for what they want in their wedding photography. Are they looking for bold, dramatic architecture? An ocean beach? A funky urban backdrop? Etc. 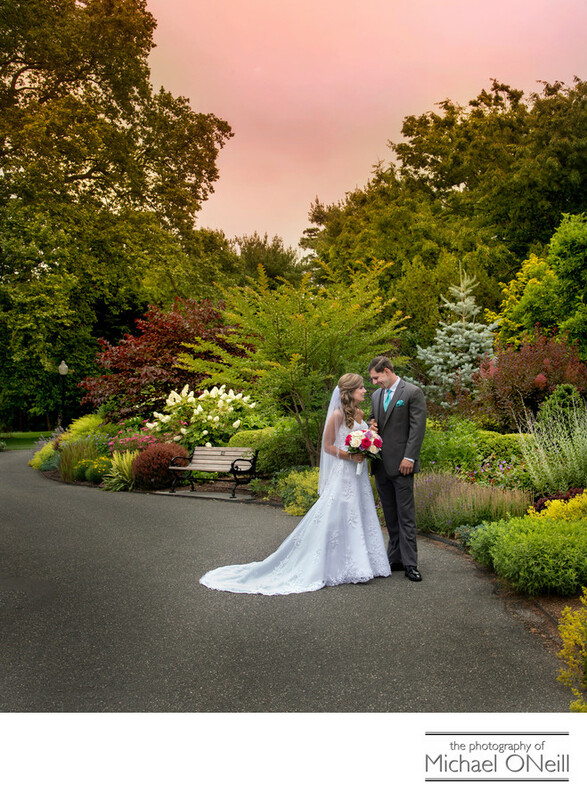 When a bride and groom ask for a park-like atmosphere, and logistics don’t prohibit it, I often suggest the location pictured here: The Bayard Cutting Arboretum in Oakdale, Long Island, NY. Conveniently located on Suffolk County’s south shore this near 800 acre park offers everything from sprawling lawns with stately old trees, beautifully manicured perennial gardens, an elegant mansion and waterfront photo opportunities along Great River and TheGreat South Bay. The site use fee for wedding photography is modest and the parking and access is perfect for large stretch limousines and party buses.